Turn the fish fillets in the dark rye flour and fry them on a medium hot pan. They should have two minutes on each side, leaving them still juicy. Clean the dill and chop it finely. Stir the dill into the mayonnaise. When serving the fillets you can either arrange them on the buttered dark rye bread. Or – like we do – arrange them portionwise on ten plates and leave your guests to butter their own bread. Either way pour the “dillnaise” in an icing bag and decorate the fillets with the “dillnaise”, lemon wedges, dill sprigs and the shrimps. It is easy to make your own flavourful mayonnaise but if you use the store-bought variety we suggest you flavour it with two tbsp mustard, salt and pepper. 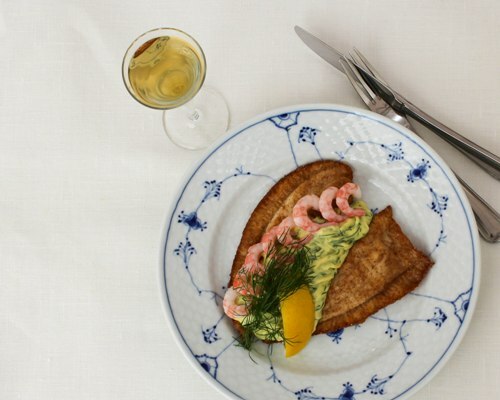 We recommend a fresh dill aquavit, preferably home-made, and a crisp, slightly bitter New York Lager with a touch of flowers from local artisan brewery, Nørrebro Bryghus, for the fillets of sole. This recipe was originally published on Denmark’s best food blog (they have it on paper ;-)) Gastromand.dk.